Formerly Homeless Man With 'Golden Voice' Back On The Airwaves : The Two-Way Ted Williams, whose striking baritone went viral in 2011, is now co-hosting a daily radio show in Columbus, Ohio, The Columbus Dispatch reports. It's his first full-time job since 1993. 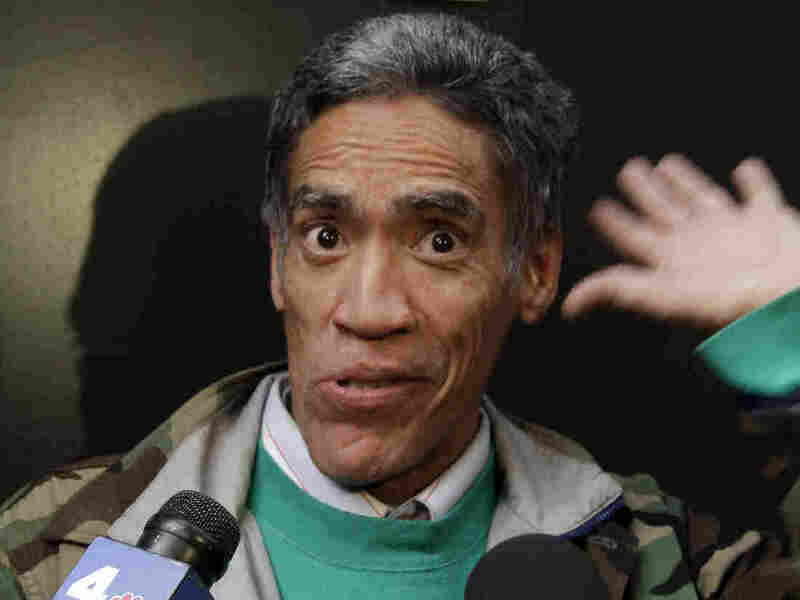 Ted Williams, a formerly homeless man pictured here in 2011, has landed a co-hosting job with a daily radio show in Columbus, Ohio. He first gained fame for his striking baritone. Five years ago, Ted Williams became famous. The Columbus Dispatch posted a video of Williams, panhandling on the side of the road, showing off a pitch-perfect announcer's voice. The video went viral, and William's striking baritone was heard around the world. Here on the Two-Way, the story led one of our longer tags ... "Ted Williams, man with the golden voice." Williams had once made a career out of his voice, but then alcohol and drugs brought him down, he explained. He appeared on talk shows, reunited with his mother, went to rehab, wrote a memoir. He was getting occasional gigs as a voice-over artist. But a brush with fame doesn't mean instant stability, as the Columbus Dispatch reports. In late 2014, Williams told the paper he had an apartment but no furniture, no car, and nothing left from the $395,000 advance for his memoir. But now, the Dispatch reports, he's got a new job: He's co-hosting a radio show on Columbus' "The Praise," WVKO-AM. The name of his daily talk show? "The Golden Voice Show." "Williams said that he hasn't used drugs since Aug. 6, 2011. "Getting up for a job each morning has supplied some much-needed normalcy: 'The sense of routine, the sense of belonging — all of that is coming back.' "
The job at WVKO marks a return to Williams' past. That's the same station, the Dispatch reports, where Williams began his radio career in the 1980s. His new role is the first time he's had a steady job of any kind since 1993, the paper says. The station's general manager says it wasn't a tough decision to bring Williams back on the job. "We teach and preach about giving second chances," he told the newspaper. You can read the whole story over at the Columbus Dispatch, where there's also a video of Williams at work. And you can catch him every weekday from 6 to 10 a.m. ET on WVKO.